The flow of scientific and technological advances from spaceflight research and development to Earth-based applications is both varied and substantial1. Historically, NASA and other space agencies around the world have played critical roles in a wide range of fields, including agriculture, climate science, environmental monitoring, human health science, materials science and robotics. This flow of scientific knowledge and technology is not unidirectional: many scientific and technological advances designed to address terrestrial problems have proven to be critical advances for spaceflight as well. If humans are to exist outside the Earth’s biosphere for extended durations, there is an absolute requirement that plants and other biological systems make the journey as well. Through photosynthesis and other metabolic pathways plants provide crew nutrition (food production), air revitalisation (carbon dioxide removal and oxygen production), and contribute to the recycling of drinking water from wastewater (through transpiration). All of these ecological services are required to keep humans healthy and productive in spaceflight environments2, and importantly, plant-based life-support systems are bioregenerative; they do not require additional inputs from Earth once established (assuming ‘local’ energy input such as solar or nuclear). Plants also contribute to the psychological wellbeing of crew members – a largely intangible but highly significant contribution when considering the long periods of isolation and difficult living conditions associated with multi-year missions. As humans venture further from Earth for longer periods of time and ultimately establish a permanent presence beyond Earth (on Mars, for example), it will become progressively more prohibitive and impractical in terms of mass and energy (and ultimately money) to supply those crews with air, food, water and other consumables from Earth. There will be a point at which complete (or nearly so) recycling of air, water, and food will become necessary, through some combination of physical–chemical and bioregenerative systems. 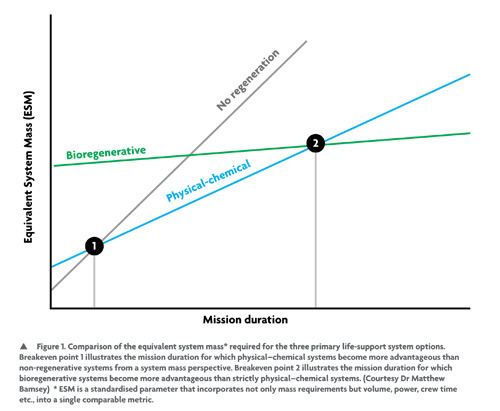 Physical-chemical systems assume almost-closed air and water recycling, but with food brought from Earth, while bioregenerative life-support systems assume almost closed-air, water and food recycling; 'no regeneration' missions are those with no significant recovery of air, food and water (see Figure 1). There are many obstacles on the path leading to a human presence on the Moon, Mars, and beyond. Many of the obstacles involve the challenges of keeping humans healthy and productive in the extreme environments that they will face, both on the journey and once established at their destination. Radiation and reduced gravity conditions are two major issues for long-duration human space exploration, issues that will require a suite of countermeasures to ensure mission success. The crew’s diet will play a large role in dealing with the effects of the spaceflight environment on the human body. The provision of fresh food, as part of a bioregenerative life-support system, is critical, as many antioxidants and other phytochemicals may not be stable under spaceflight storage conditions. Further, the provision of fresh food has a very powerful psychological benefit for the crew, which is vital during long missions. Tree fruits have long been deliberated on as potential menu components for the crews that will venture beyond low Earth orbit (LEO). A continuous supply of fresh fruit could provide unique nutritive contributions to the crew’s diet and offer enhanced menu diversity to prevent menu fatigue3. Although highly desirable, tree crops are also highly incompatible with spaceflight crop production and bioregenerative life-support systems in general: they are large, take a long time to mature and, in the case of temperate species, require a cold dormancy period between fruiting cycles. The space available for crop production in any current or foreseeable spaceflight plant production system is limited and certainly could not accommodate a typically sized fruit tree. Trees also take three to twenty years to mature enough to flower and fruit, timeframes that are incompatible with current mission scenarios. Temperate tree fruit species, such as plum or apple, only produce fruit once per year – they do not produce fruit continuously as would be required in a bioregenerative life-support system. Finally, there is also concern with tree crops regarding their harvest index (the ratio of edible biomass to total biomass), as trees tend to dedicate significant resources to the development of wood relative to fruit. As previously mentioned, terrestrially focused scientific and technological advances can and do solve spaceflight problems, often unbeknownst to those making the advances. One such advance that seems to have overcome the barriers to using tree fruit in bioregenerative life-support systems is the recent development, by United States Department of Agriculture (USDA) researchers, of plum trees (Prunus domestica) that over-express the flowering locus T1 (FT1) gene taken from Populus trichocarpa, a poplar species native to North America4. These FT1-plum trees were developed in the hope of accelerating the breeding cycle of plum trees (on Earth) in order to confront pathogens, such as the plum pox virus, that have devastating impacts on plum production globally. Through the over-expression of the FT1 gene, the USDA was successful in getting the trees to flower and produce fruit within one to ten months compared to three to seven years for typical plum trees4. The greatly accelerated breeding cycle has allowed those same researchers to develop disease-resistant cultivars in a fraction of the time it would normally take5. In addition to a greatly accelerated flowering and fruiting cycle, the over-expression of the FT1 gene resulted in several other alterations in the typical growth and development patterns of the plum trees (see Figures 2, 3 and 4), which could allow these fruit trees to conform to the constraints of spaceflight agriculture6. Many plants, particularly trees, exhibit apical dominance, which is the dominant growth of the central stem over the development of side branches. The over-expression of FT1 in plum trees seems to disrupt apical dominance, resulting in a more prostrate or bushy growth pattern (see Figure 4). 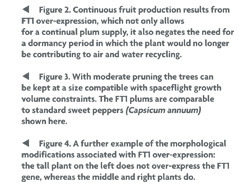 The effect is sufficient, with moderate pruning, to allow the FT1 plum trees to be comparable in size to other herbaceous spaceflight candidate crops such as sweet peppers (Capsicum annuum) (see Figure 3). Further, this modified growth habit also seems to reduce the amount of wood production relative to fruit production. This could reduce the amount of inedible biomass that the overall life-support system would need to recycle, while improving the harvest index of the crop (see Figure 2). Plant scientists and system engineers developing bioregenerative life-support systems strive to have consistent production of all the life-support services (air, food, water). In terms of food production this means that a candidate crop should either be easily staggered (i.e., planted at regular intervals to ensure continual production) or indeterminate (i.e., it grows and produces fruit continuously; e.g., vine tomatoes). Tree fruit species have not met either of these criteria until now. Under the influence of the FT1 over-expression, the plum trees developed by the USDA flower and fruit continuously, much like indeterminate tomatoes; they do not require a cold dormancy period for new flower buds to open. Another note of interest is that, through sheer coincidence, there is a significant body of evidence to suggest that the phytochemical complement found in plums can prevent or even reverse bone density loss in terrestrial rodent and human models7,8,9,10. The ramifications of this are considerable, given that microgravity and ionizing radiation-induced bone density loss are major barriers to long-duration spaceflight. A recent NASA-led study has shown the intake of dried plums to be a very effective countermeasure against bone loss (in rodent models) resulting from exposure to ionizing radiation; exposure such as that which would be encountered during interplanetary exploration missions10. These findings once again demonstrate the bidirectional flow of scientific and technological developments between Earth and Space. It is worth noting that the loss of chilling requirements due to FT1 over-expression can shed light on the mechanisms that govern fruit-tree dormancy. This information will be critical in efforts to adapt current food crops to climate change. As the range in which plums are currently grown warms, existing cultivars may no longer receive sufficient chilling to prompt flowering. The USDA’s so-called FasTrack breeding system, combined with the knowledge gained from a better understanding of dormancy regulation through FT1 over-expression, may help to prevent the collapse of tree fruit crops, such as plums, in their current range. The development of the FT1 plums was in no way motivated by spaceflight aspirations, rather it was firmly rooted in the need to address a very real threat to an important food crop on Earth. Regardless, the advances made by the USDA has helped NASA open the door to an entirely new class of candidate crops for bioregenerative life-support. In return NASA and the University of Guelph are developing the horticultural management protocols (such as vegetative propagation methods and controlled environment production) that will help the USDA further develop these plums for terrestrial applications, such as vertical agriculture and other high-density cropping systems. Dr Thomas Graham is currently the Research & Development Manager at the University of Guelph’s Controlled Environment Systems Research Facility, and former NASA Post-Doctoral Research Fellow at the Kennedy Space Center. He has been involved in controlled environment plant production research, including bioregenerative life-support, for nearly 20 years. This article is taken from the February 2016 edition of the environmental SCIENTIST. NASA. NASA Spinoff: Technology Transfer Program. https:// spinoff.nasa.gov [Accessed 20 January 2016]. Wheeler, R.M. (2010) Plants for Human Life Support in Space: From Myers to Mars. Gravitational and Space Biology, 23, pp.25–36. Bourland, C.K., Kloeris, V., Rice, B.L., and Vodovotz, Y. (1999) In Nutrition in Spaceflight and Weightlessness Models (eds. Lane, H.W. and Schoeller, D.A. ), pp.19–40. CRC Press LLC Boca Raton, FL. USA. Srinivasan, C., Dardick, C., Callahan, A., and Scorza, R. (2012) Plum (Prunus domestica) Trees Transformed with Poplar FT1 Result in Altered Architecture, Dormancy Requirement, and Continuous Flowering. PLoS ONE, 7, e40715. Srinivasan, C., Scorza, R., Callahan, A., and Dardick, C. (2014) Development of very early flowering and normal fruiting plum with fertile seeds. Patent #: US8633354B2. Graham, T., Scorza, R., Wheeler, R., Smith, B., Dardick, C., Dixit, A., Raines, D., Callahan, A., Srinivasan, C., Spencer, L., Richards, J., and Stutte, G. (2015) Over-Expression of FT1 in Plum (Prunus domestica) Results in Phenotypes Compatible with Spaceflight: A Potential New Candidate Crop for Bio-regenerative Life-Support Systems. Gravitational and Space Research, 3(1), pp.39–50. Smith, B.J., Bu, S.J., Wang, Y., Rendina, E., Lim, Y.F., Marlow, D., Clarke, S.L., Cullen, D.M., and Lucas, E.A. (2014) A comparative study of the bone metabolic response to dried plum supplementation and PTH treatment in adult, osteopenic ovariectomized rat. Bone, 58, pp.151–159. Metti, D., Shamloufard, P., Cravinho, A., Delgado Cuenca, P., Kern, M., Arjmandi, B., and Hooshmand, S. (2015) Effects of low dose dried plum (50 g) on bone mineral density and bone biomarkers in older postmenopausal women. FASEB J., 29, 738.12. Smith, B.J., Graef, J.L., Wronski, T.J., Rendina, E., Williams, A.A., Clark, K.A., Clarke, S.L., Lucas, E.A., and Halloran, B.P. (2014) Effects of dried plum supplementation on bone metabolism in adult C57BL/6 male mice. Calcif Tissue Int, 94(4), pp.442–453. 10.